This law had nothing to do with casual sports bettors. It was a direct attack at a major source of income for organized crime syndicates. Albeit unintended, it is still one of the two laws on the books that make sports betting illegal to this day. Many say the wire act was intended to help solve organized crime gambling rings while also helping the average sports bettor get a fair shake. Others argue that it was intended to make all sports betting illegal. The gray area in the Federal Wire Act have had almost 60 years of ramifications on the gambling industry that even Kennedy couldn’t have foreseen. “In light of these domestic and global trends, the laws on sports betting should be changed. 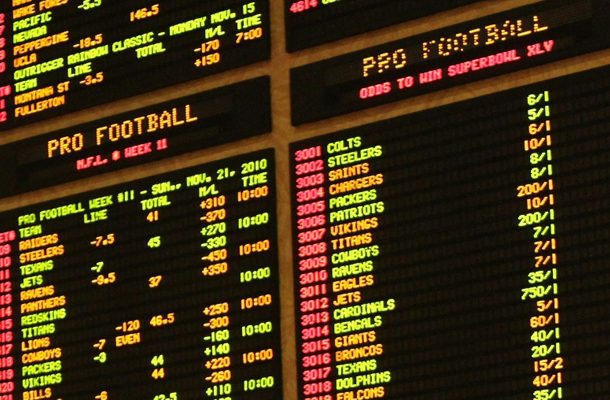 Congress should adopt a federal framework that allows states to authorize betting on professional sports, subject to strict regulatory requirements and technological safeguards. These requirements would include: mandatory monitoring and reporting of unusual betting-line movements; a licensing protocol to ensure betting operators are legitimate; minimum-age verification measures; geo-blocking technology to ensure betting is available only where it is legal; mechanisms to identify and exclude people with gambling problems; and education about responsible gaming”. After the Supreme Court ruled they would hear the case, Manfred said that if sports betting becomes legal, Major League Baseball wants a say on the issue and to be involved on the new regulatory scheme. NFL commissioner Roger Goodell and NHL boss Gary Bettman most recent statements are their leagues are still opposed to legal sports betting. This despite the fact that The Oakland Raiders will be the Las Vegas Raiders in 2020 and The Las Vegas Golden Knights hockey team will debut this fall. The PGA and Major League Soccer also seems ready to embrace legalized betting on its tournaments and matches. March 2009 – State Senator Raymond Lesniak files a lawsuit challenging PASPA as unconstitutional. November 2011 – New Jersey puts sports betting to a vote and by an overwhelming margin of 2-1 its citizens vote to legalize sports betting in the state. The next day Senator Lesniak introduces a bill to legalize sports betting in Atlantic City casinos and horse racing tracks. December 2011 – The NY Times reports that the United States Justice Department reversed its opposition on internet gambling, going against their long-standing support of the 1961 Wire Act. Their opinion dealt more with allowing states to sell lottery tickets online but it gave the movement to legalize betting a major boost. August 2012 – The four major American sports leagues, the NFL, NBA, MLB, NHL along with the NCAA bands together and files a lawsuit to block legalized betting in New Jersey. March 2013 – New Jersey Circuit Court Judge Michael Shipp rules against the state’s case to legalize sports betting. September 2013 – The case goes to the 3rd U.S. Circuit Court of Appeals in Philadelphia where it loses by a vote of 2-1. The Federal Court of Appeals later decides not to hear the case. 2014 – As four Atlantic City casinos shutter their doors, New Jersey submits their case to the Supreme Court for review. January 2017 – The week of President Donald Trump’s Inauguration, The Supreme Court delays announcing if it would hear the case stating it would like to hear what the President Elect’s views were on the matter. May 2017 – President Trumps Solicitor General Jeffrey Wall urges the justices to not hear the case. June 27th – Despite the fact that the Supreme Court usually follows recommendations from the Solicitor General and Department of Justice, The United States Supreme Court announces that it will indeed give New Jersey its day in court and vote if PASPA is unconstitutional. If it rules in New Jersey’s favor it would allow sports betting to become legal in the state and open the door for other states to follow. Licensing and Certification guidelines for all gaming facilities accepting wagers. Safeguards against financial crimes pertaining to wagering. Privacy and data security safeguards as well as ensuring the integrity of sporting events. Congressman Pallone is the ranking member of the United States House Committee on Energy and Commerce, which is one of the oldest and most respected committees in the House of Representatives. Pallone has the backing of the committee, The American Gaming Association, and casinos all over the country (including many Vegas casinos whose corporations own gaming resorts outside of Nevada) This case will be watched closely by other states who will have to quickly decide if they want to draft their own legislation for legal sports betting on the state level. At least eight states have already introduced bills to legalize sports betting- Connecticut, Hawaii, Maryland, Michigan, New York, Pennsylvania, South Carolina and West Virginia. Those eight are just the tip of the iceberg. If the 1992 PASPA law is repealed, other states are sure to follow knowing the kind of tax revenue it will entail. Donald Trump’s Solicitor’s recommendation that the Supreme court not hear the case doesn’t necessarily mean he is opposed to it. He has in the past been in support of legal sports betting. As a former casino owner who had 2 resorts in Atlantic City close, he knows more than most the plight of New Jersey and other states who need the tax money that accompanies sports betting. It is widely believed he would sign a sports betting bill if it came across his desk. Americans will never stop betting on the sports they love. Many people only tune into sporting events because they have action on the game. If the Supreme Court upholds PASPA the bets will not stop and the money will keep going to shady offshore websites and underground bookies. How laughable is PASPA in today’s America? Former President of The United States Barack Obama appeared on Stephen Colbert’s Super Bowl after show in 2016. Obama told Colbert “After every Super Bowl I call the winning team to congratulate them, and sometimes I call the losing team, especially if I bet on them.” when reminded by Colbert that betting is illegal, Obama laughed and said “I’m The President, I hereby pardon myself” Nothing more was said between the two as the crowd laughed because nothing more needed to be said. Even the former President of The United States knows this law is a joke.